Hello everyone! I have some sad news to deliver... I broke the middle finger nail on my photo hand yesterday, and cut down all the rest of my nails to match it. Of course, I am awful at shortening my nails, so now they are not only incredibly short but awkwardly shaped to boot. Such is life though! Hopefully I can scrounge up enough content to bide me time until they grow out a bit. Honestly I don't mind that they are short, it's the shape that is getting to me! Today's manicure I had taken photos of, but hadn't posted yet. So these are my old, unbroken nails! I started with a base of Wet N Wild Black Creme. Then I added on one layer of Sally Hansen Glass Slipper, which is a white flakie polish. I added on one coat of Revlon Royal, which is a blue jelly polish. So technically, this is a jelly sandwich, even though it doesn't necessarily look like many jelly sandwiches that I have done or seen. It was not my intention, but this ended up looking a lot like Inglot 204, which is a royal blue flakie. So if you like Inglot 204 but don't own it, this is a good way to get the look using drugstore polishes! Of course, I couldn't stop there, so I added on a coat of gLORIous, a holographic topcoat made my the fabulous Lori. If you have Glitter Gal Silver or HITS Hefesto, they are both similar effects. 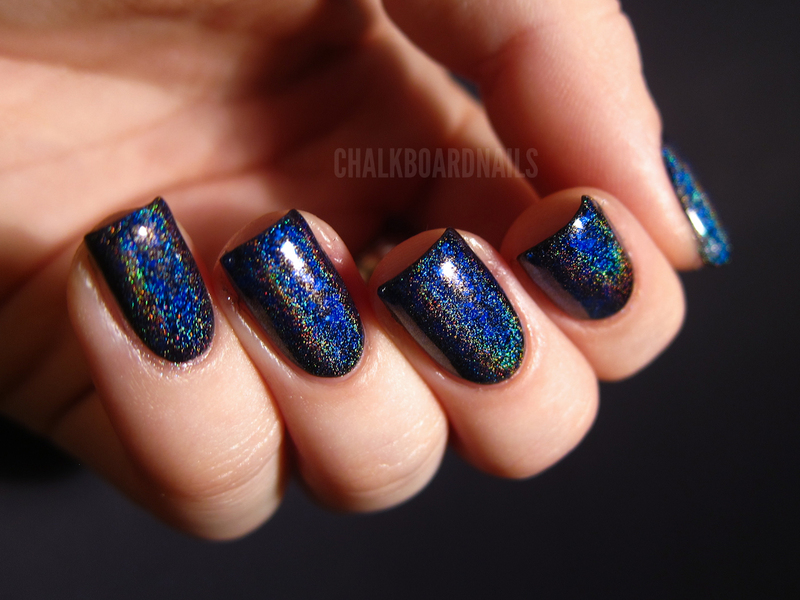 I had never seen holo over flakies before, and it is a very interesting effect. It is kind of hard to tell in these photos, though -- here the look just ended up looking like DS Glamour over black. SUPER GORGEOUS!!!!!!!!!!!!!!! but not sure what ur talking about.....'short nails'!?!?!?!? they look very long & beautiful to me :) they're currently way longer than mine ever are. beautiful jelly sandwich layering! So pretty and interesting I have those polishes I should try this. So beautiful! And anything that can be compared to Glamour is an automatic A+++ in my book. I'll pray the nail god for you, Sarah! I'm love with your mani! this is seriously beautiful!!!! Gorgeous! I love each stage of this manicure! I broke my right thumbnail last week. It's still too short for my liking, so it's bare nails this week for me. Wow, is this gorgeous or what? I have all of these but the holo topcoat. I wonder what it would look like with Fairy Dust instead? Hmm. I'll pray to the Nail Gods for you! I just started getting mine past the nubbins stage after a couple of bad breaks, and I can ALMOST file them into good shape again, so I totally feel for you. omg these are great!!! i love them! Oohh this is so pretty! ......... I started drooling when I seen this Jelly Sammie. Gorgeous! Friggin genius!!! I luv it girl!! 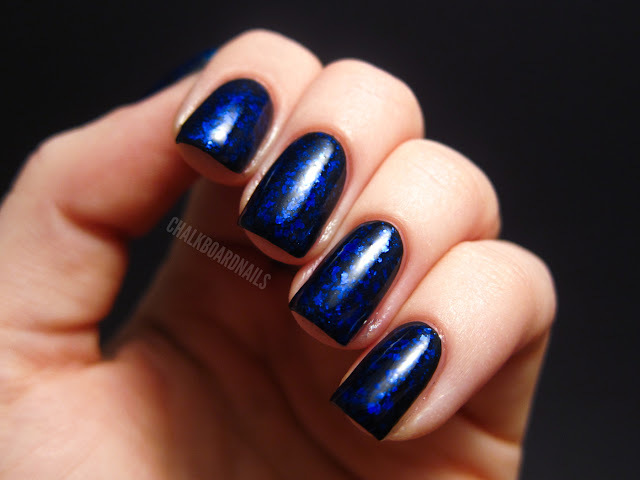 The version with blue flakies is STUNNING! 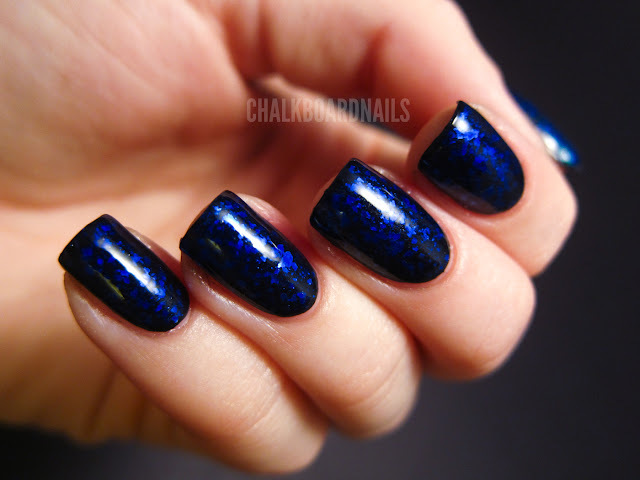 This mani is stunning!!! OMG! These nails are longer than mine-and you say they are short??? They will grow back!!! No no ... these were taken before I had my tragic break. Haha. Ahh I'm sorry but I liked these SO SO SO MUCH better without the Holo. It's far too overpowering - at least in the pictures. But great idea, I really like it :D Now I just need to learn which of my polishes are jellies so I can try to replicate. Did the holo overshadow the jelly sandwich? I cannot tell from the photos.